Photo of Jack and I by White Sails Creative. Pretty dresses, smart shirts and funky patterns always look good! You heard me, you want to look your best self, right?! 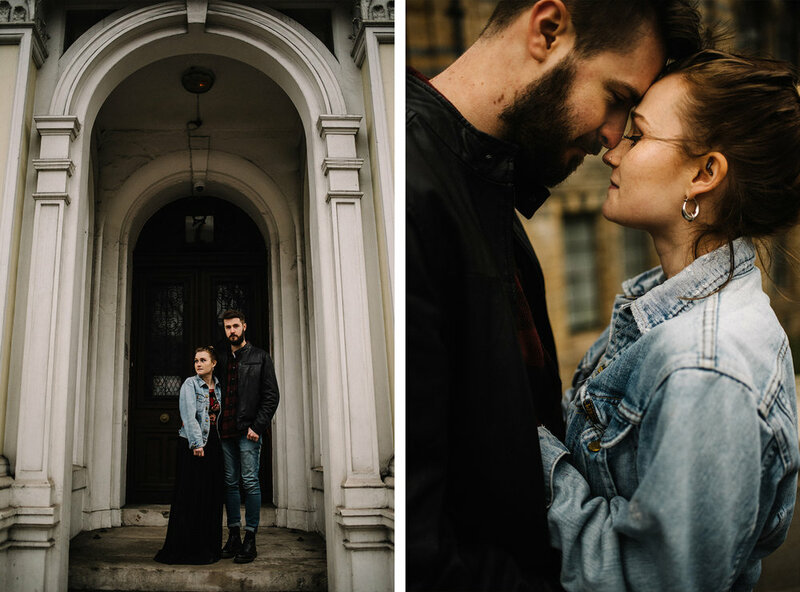 When I searched for what to wear for Jack and I’s couple photos with Emily Tyler Photography, I knew I wanted to wear a flowy, boho dress, and I knew that black is usually my go to struggle… So those were my main cocerns. Only I also knew it would be a struggle because I’m only 5ft tall and most midi dresses are maxi dresses on me! I actually ended up getting my dress second hand but it was brand new (I am a savvy bargain hunter!) on depop, so definitely check out auction sites. Flowy dresses and windswept hair are the best! You should always make sure you take care of those details too… That means cleanly polished shoes, neat nail polish and accessories that match! Jack and I co-ordinated with red as our main theme! Photo of us by Emily Tyler Photography. Tip #3: Make sure you’re comfortable! I always wear my Doc Martens so naturally I wore them to our shoot! Photo of us by Emily Tyler Photography. I love a good cardigan, or pair of sunglasses or a hat - it can TOTALLY change up an outfit. Jack opts always for rings, he just loves them, and I wore my Grandmother’s 21’st birthday bracelet in our photos too. I always suggest bringing things that you can add into your photos too, like little handbags, scarves, or umbrellas if it might rain, and a chunky knit cardigan or coat to switch up your look is always good too. Please just make sure you’ve got an alternative so that you can be warm enough if it’s going to be chilly! Remember the photos of the 90s, in matching blue wash jeans and white t shirts? You don’t want to look like that, do you?! (If you do I may not be for you!) Most of my couples either opt for neutral tones (which always look lovely at the beach!) or brighter colours. Think primary colours for the most part, as these always photograph well, and never ever anything fluorescent. Matching too much can look a bit odd, so try to stick to alternatives - by which I mean don’t both turn up in bright yellow garments. However, a yellow dress for a lady and a white shirt and black jeans for a man can look smart. Similar colour pattern, but not so matchy that you look like siblings! Blue at the seaside always looks good! That said, you also don’t want to opt for tops with branding, logos or slogans on. Plain is best, and ages much better too! You’re welcome to wear patterns too, but ideally don’t both turn up in checkered garments. Florals always look lovely, and you can usually pull out some of the colours in them to accessorise or co-ordinate with each other. If you’d like to get some more inspiration, I have a Pinterest board here chock full of outfit ideas, so have a browse and see what takes your fancy! As always too, if you’d like to get the latest news and special offers, you can join my newsletter here!